Captain Sailnator: Hello Kristy and Thomas. Thanks for taking the time for this interview. Who are you and how did you get the idea to cruise or to live aboard? Thomas: Hey everyone, we are Kristy and Thomas. While Kristy is citizen of the USA, we met in Cologne (Germany), where I lived and studied. We actually still live there together now to work and save up as much money as we can. It is unclear how exactly we came to the idea to sail. It had something to do with us being in our late twenties and not being satisfied with the idea of jumping into crazy office jobs yet (or ever!). Luckily we live close to the Dutch border and the Dutch are a big sailing nation, so access to water bodies of water and the sailing spirit is not too far away. Kristy: After renting small daysailers, the idea came to us spontaneously. Perhaps it had something to do with the cost of renting so often, with the limitations, coupled with a wild sense of adventure. However, the process to fruition took quite some time. The renting out small keelboats thing was getting quite expensive, since the desire to sail was huge. So we decided to buy a small 18 foot Hurley Silhouette and sail it on inland waters (Roermond, NL) to gain experience, presumably before taking the financial leap into something larger, that is of course, if we even enjoyed it. Thomas: That worked out nicely for two years. We even did a two week cruise from Roermond, NL to the coast of Grevelingenmeer, NL and back. Which was really cool on such a small boat. We were definitely the little fish in a big pond amongst very large yachts… But eventually we wanted to live on a boat full time, it is just too romantic. 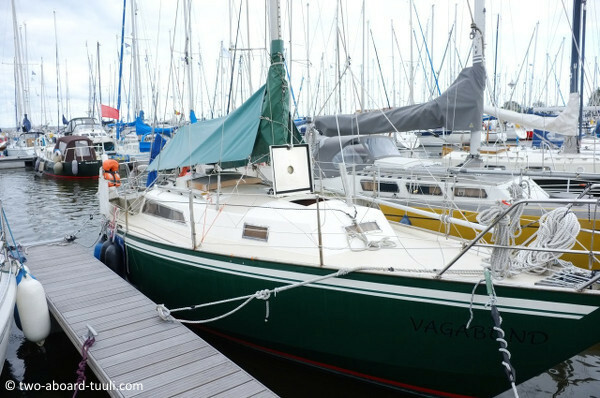 So we needed a larger vessel and finally found Tuuli, who was originally called Vagabund. Kristy: Our friends are very encouraging and that is a great support! When dealing with parents delicate change management is important in avoiding heart attacks and/or nervous breakdowns. We do not recommend being completely forthright. We would strongly recommend saying you are going on a small holiday. Thomas: We are currently in the process of liquidation. We will be selling our car as well as everything else possible. What is leftover will be donated. Anyone interested in some student apartment furniture? Thomas: Actually, at the university sports club. That was in 2013, I believe. So not so long ago, but the spark lit quickly! 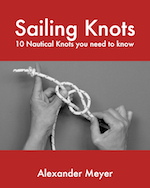 While the German sailing and boating courses only prepare you to know the absolute bare basics, you really learn it the hard way, as soon as you are skippering your first rental boat. (Which is quite relaxed in the Netherlands, you don’t even need to have a license. You just have to put your salty look on your face :) In short, we are always learning. Thomas: Before we bought Tuuli, we had experience with our 18 footer “Rubio” and the boat rentals. 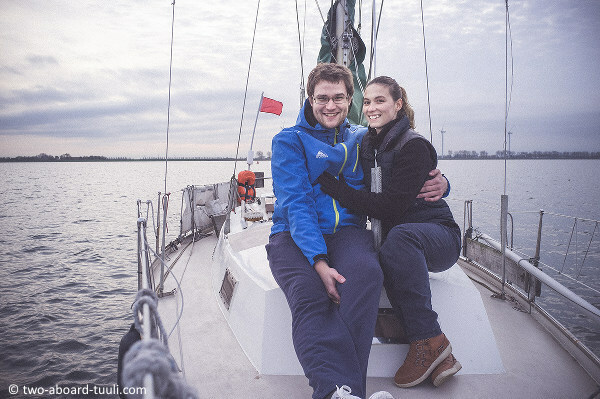 We sailed around the German island “Rügen” in May 2015 with a 29 foot sailboat and that prepared us well for Tuuli. Kristy: We have both been cultivating and saving all of our money for over two years. We also put the money we got from our wedding into a “Sailboat” account which helped us pay for the boat. Our living money will come from the selling of our car, along with Thomas’ income. He will continue working as a software developer, while we cruise. Thomas: Tuuli is a Dutch built Wibo 930 and was designed by Ericus Gerardus van de Stadt. She was built in the late 1970’s and her real birth year is unknown. The hull and superstructure is made out of steel. The mast is made out of anodized aluminium. She is 9.3m (31 ft) in length with a beam of 3m (9.8ft). The draft is around 1.5m (4.9 ft). Tuuli is equipped with five sails: a storm jib, a high-aspect jib, a genoa, an asymmetrical spinnaker and the main sail. Kristy: One day we asked ourselves why we were only looking for fiberglas boats. We quickly discovered that steel boats have their charm too and are reasonably priced. It just happened, as with most of our purchases, that the Wibo 930 was available at the time, at a reasonable price. And then we went for it. Thomas: In Germany there is a eBay branch that offers a web service just like Craigslist in the US. It lists local classified ads. So we found Tuuli online and contacted the seller couple that turned out to be living in a neighboring town of my hometown. They were really considerate and conscious boat owners and gave us the feeling that the boat has been taken care of very well over the past years. After looking at the boat twice and a sea trial we were convinced that this was our boat. Thomas: After looking at a boat that was sold by an obnoxious agent, we came to the conclusion that we don’t need another extrinsic motivated force in the equation of buying a boat and getting a contract together. We did not get the boat surveyed. After seeing the survey that was conducted by the previous owner, we lost belief in the necessity of paying someone a bunch of money to tell us things we already knew. We did not even lift the hull out of the water. We saw pictures of the boat lifted out of the water earlier that year. And oh well, osmosis is obviously not a problem for steel boats. 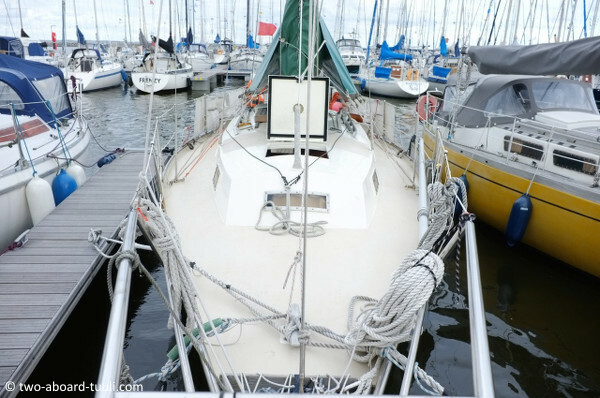 The previous owners had just returned from their summer cruise down the coast of France and based on their appearance would have never left for such a trip if anything was not 100% perfect to the boat. After all it is steel and issues on a steel hull are generally less time consuming to repair than on fiberglas. So we saved quite a lot of money on agents and surveys. If all else failed, since they came from a neighboring small town, and were known by mutual friends I think it would have been a relatively safe gamble. Thomas: There were no obvious problems to the boat. Almost too good to be true! Kristy: Not really hidden, but extending your boat if the superstructure and hull is made of steel requires some welding skills. We did not realize the possible dangers of drilling holes as you wish into the deck (rust, corrosion). On a fiberglass boat you can mount everything easily however you like by just drilling some holes and sealing them up. But hey, everything is possible, it just takes a bit more planning ahead! Kristy: We basically did not know much about plumbing and engine maintenance. So the learning curve was quite steep there, but the Internet and especially YouTube is a great resource to find information. Luckily, Thomas would call himself quite handy with woodwork and electrical topics, so we can do quite a lot by ourselves. Thomas: The refit and upgrade projects can not be more expensive than our budget, because they take up all of our budget :) We are still in the process of getting the boat ready for full time cruising in late 2016 and every earned Euro goes into the project. That our way of living at the moment. We cut back on a lot on other ends of our lives. Kristy: The costs so far are almost untraceable. We would agree on under 25000 Euros, all in all. But are very much unsure about exact numbers and the boat is not cruising ready yet. Mandatory upgrades still need to be applied over the course of the summer. Kristy: Stop buying things that are not boat related. People get really attached to their personal property, and it seems that for every one thing you own, you must buy something else to accompany it (store it, hold it, repair it, use it, match it..). Break the cycle! Plan ahead, and keep track of every expense. Make saving a contest. Prioritise the things you really need to be happy and healthy. You don’t need forty¬two feet. Just remember you are not the first to do this, and although it seems everyone who sails is a millionaire, it’s just not the case. There are loads of encouraging real¬life stories out there to reference to help you make the leap from dreamer to doer. People sail with little¬to¬nothing. Captain Sailnator: What are your future plans? Thomas: Our future plans are to untie the lines in late summer this year (2016) in the Netherlands. We want to sail down the Dutch, Belgian and French coast, gather all our courage together and make the jump over the Bay of Biscay. But we won’t rest for long after having mastered the Biscay and head further south to Portugal and hopefully make the big jump to the Canary Islands. Kristy: It is pretty much the barefoot route that most sailors dream of. The Cape Verde Islands would be awesome to see and a jump to western Africa! And oh boy are we dreaming of crossing the Atlantic. But in order to find out if we make it there and across you have to follow our adventure :) Then…. The Pacific? 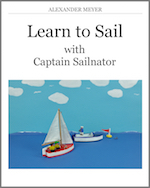 Captain Sailnator: Where do you publish your adventures? And we have a Patreon-Page where you can support us! Captain Sailnator: What is your intention by sharing your life? Kristy: It is an interesting way to keep track of change over time. Sharing the story online commits you to actually do things, because feedback from followers always pushes you forward. Hopefully we can convince somebody out there that is right on the edge of the decision making process of buying a boat to just do it. As Lin and Larry Pardey phrased it: Go small, go simple, go now! 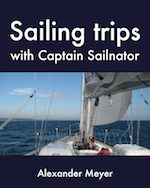 Captain Sailnator: What was your best sailing experience so far? Kristy: Best so far was the feeling of sailing away for two weeks on our own for the first time. That was with the Hurley. That feeling of being free and able to go wherever we want, awesome! If we look back so far, the memories of little great things sticked to our minds. For example, when we realized how easily Tuuli maneuvered in the harbour and through locks, or this one afternoon when we circumnavigated the German island Rügen. The wind was blowing with constant 15 knots out of the east, the sun from above, as we were flying down the east coast of Rügen on a beam reach. Thomas: Speaking of the sun. We get weather information through three channels. First is the awesome web service of windfinder.com and their smartphone apps. Although, this obviously only works with a good Internet reception. We cross check the information with GRIP files, displayed in zyGRIB (http://www.zygrib.org/). This is especially interesting for passage planning to look ahead and overlay the weather information on a map. We are really interested in weather fax reception via shortwave radio. The idea of receiving weather information via a single-side-band radio is really intriguing and we are scanning the eBays of the world for affordable SSB radios. We already tested the decoding of the weather signal via a tablet computer app and it is so fascinating to see the image build up should from the noise coming from the radio audio. Thomas: For the first part of our journey we carry the Reeds nautical almanac published by the British admiralty that covers all the Atlantic facing countries of Europe to the Canary Islands. Furthermore we carry the book “Ocean Passages and Landfalls” by Rod Heikell and Andy O’Grady which is big and fat and expensive. But it contains information on landfalls, even with port maps on every country in the world. It is incredible. We get so much information out of this! Furthermore there is the Internet. If available marinas and anchorages can be googled. http://www.skipperguide.com/ is creating an open platform for sailors to build up a knowledge base about countries, marinas and even bars. You should check it out and consider contributing your local knowledge! Thomas: We supplement expensive chart-plotters with our tablet computer that was specifically purchased for this task. It is a Sony Xperia Z tablet and claims to be waterproof (to a certain degree). We use the Transas iSailor app for map display and hope that they include the NMEA AIS display in the near future, as they already have on the Apple iOS equivalent.We carry a laptop computer with the OpenCPN as a backup as well as harbour approach maps as paper charts as a backup. Captain Sailnator: That was a lot of information so far. Do you have a closing statement that you would like to share with us? Kristy: We are really pleased with the sailing community and how welcoming everyone is. We are just in the beginning of our “sailing career” and already feel at home on the water. It would be awesome if you follow our journey digitally but it is also fun to meet sailors in the real world. So if you feel that we are sailing close by, drop us a message. We would love to hear from you! Ahoy! Captain Sailnator: Kristy and Thomas, thank you so much for this interview. It was really fun for me and I think the readers can learn a lot from it. Who wants to know more about you should check your blog and I am really looking forward for upcoming videos on your Youtube-Channel about your adventure. I wish you all the best, a safe journey and always fair winds!